Como Loop coupled with Ridgeline Loop Mountain Bike Ride is an awesome ride! This is some of the most pristine desert just north of Tucson in Oro Valley called Tortolita Mountain Park. The scenery on this ride is spectacular. 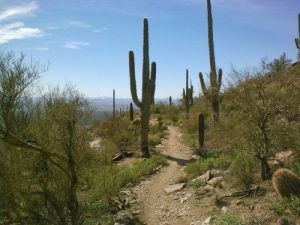 This mountain bike ride has a little of everything: jeep trail, single track, dirt road, steady climbs, fun decents, flats, and some technical stuff. Make sure you are either riding with a partner or you bring things to fix a mechanical. If you breakdown on this ride and are by yourself a cell phone will not save you. You will be walking out. There are some tricky turns that are easy to miss. Best to download the GPS file on the link below and add the ride to your Garmin Edge so you wont get lost.